You can substitute ingredients that may be less healthy and more overprocessed, for ones that are healthier and better for you. Although I try to eat healthy most of the time, I love baking. Or maybe I just love eating the dough. Either way, baking is a part of me. Even though I would not consider cookies to be a healthy everyday food, I still like to use better ingredients when possible. When using better ingredients, this does not give me permission to eat more - even if I really want to. I still limit the amount of sweets, sugar, baked goods, desserts, etc. that I am eating. But if I cna use less processed ingredients that are better for me and my family's health, then I will. Here is a list of some better ingredients to have in your pantry to decrease your exposure to toxins while still enjoying cookies. White Whole Wheat Flour - This is great to have because it is whole wheat, but a lighter version. The white whole wheat is not as dense as regular whole wheat, so using it in baked goods works out better. Grass-fed butter - Happy cows should roam free and eat eat grass. When they are confined, they can develop infections. When they do not eat properly, they may not be at their optimal health (like us, right). Healthy butter comes from pastured, grass-fed cows. Chocolate chips - Finding organic chocolate chips has been quite a challenge. I have found chocolate chips with only 2 ingredients. These Enjoy Life Chocolate Morsels are the best I have found so far. Pastured Eggs - These eggs come from chickens who have been raised outside, in a pasture. They will have more omega-3 fats and more vitamins and minerals. Organic sugar & organic brown sugar - Although these are more expensive than regular sugar, I tend to splurge because I try not to eat much sugar regularly. I should admit though that when holidays roll around and I am making tons of cookies and candy, I don't always buy organic because of the cost. Coconut Sugar - Coconut sugar is an interesting one. On the one hand, it is lower on the glycemic index. Therefore, it will not raise your blood sugar levels as much as regular sugar. However, coconut sugar has a higher amount of fructose. Fructose is a sugar that is processed through the liver, which puts more strain on the liver. So using it once-in-a-while, while at the same time decreasing overall sugar consumption is most ideal. Organic vanilla extract - you can buy this organic, but an even better option is to buy organic vanilla beans and make your own extract. It is really easy to do and is much less expensive. And with the leftover vanilla beans, you can scrape the vanilla in recipes like shortbread cookies and have wonderful flecks of vanilla. Sea salt - Sea salt has minerals in it that are not in regular table sat. Regular salt is stripped of the healthy minerals because of the processing. Although this is not an extensive list of every ingredient you might us to bake, these are the basics. 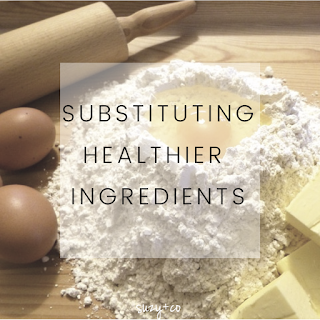 Even if you can just substitute one or two ingredients for a healthier version, you will be on the right track. It is not what you do every once in a while that will make a big impact on your health, it is what you do consistently. Small, consistent changes day in and day out can produce great results in a year. For more tips, simplicity and nutrition in your inbox, sign up here.